When we first moved here and were still living in a serviced apartment attempting to find my way and to find what my new role would be in this our new life, I would spend many a lazy afternoon reading magazine after magazine on what to do, where to go and what I should join in Singapore. 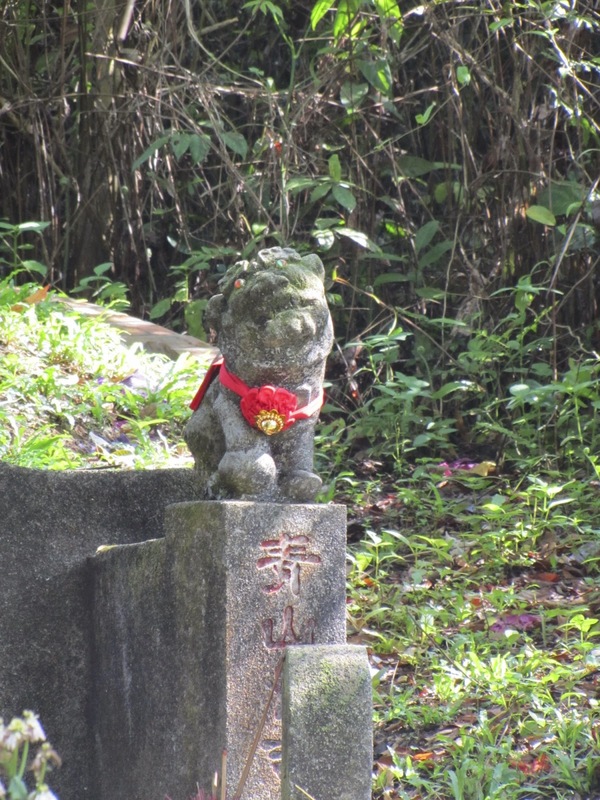 Amongst all the info I read the one item that stood out for me was an organised "walk" to Bukit Brown cemetery. May be an odd thing to stand out but, although I didn't attend I did put it on my list of what I should do now I was working at being "blissfully free" A list that now 14 months later is growing longer and longer and with no likelihood of ever reaching an end as it continues to grow faster than I can tick items off - who said there's nothing to do in Singapore! 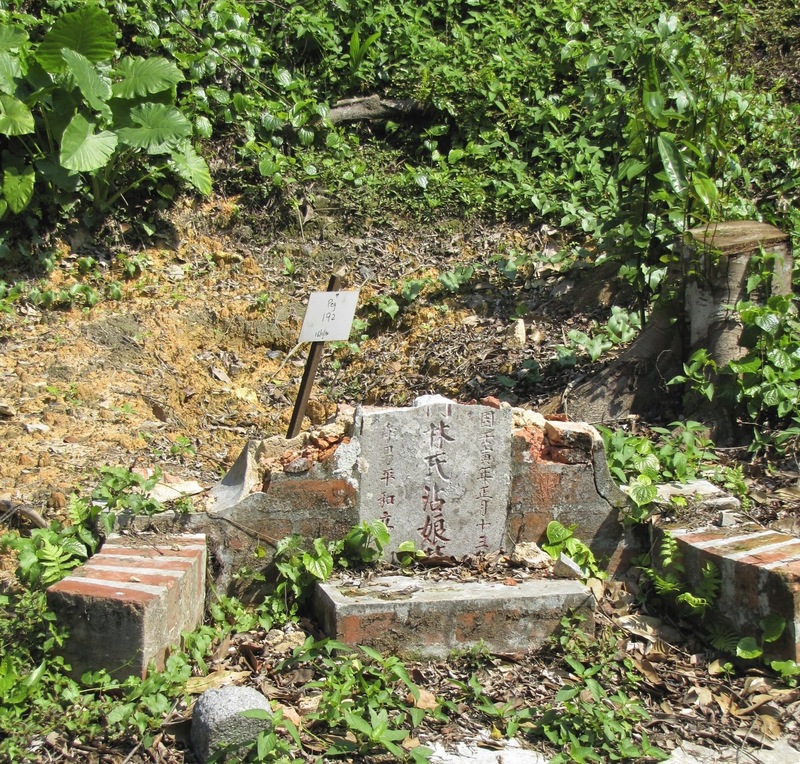 Anyway what shocked me was that the article explained that much of this historical cemetery was to be cleared to make way for an expansion of the highway. 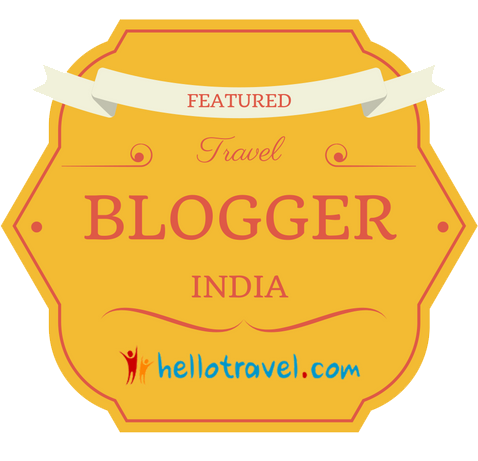 It turned out that this was to be the first proper visit away from the tourist areas and museums that we would visit. 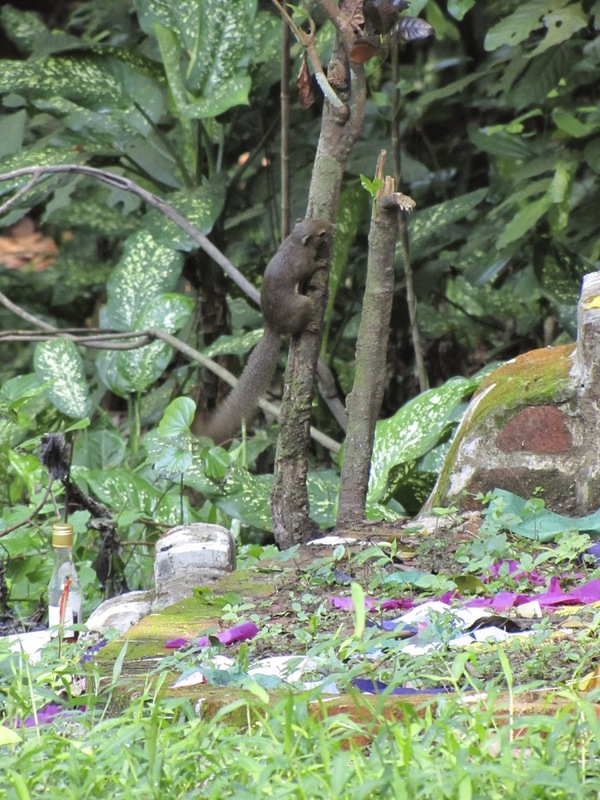 It was a first in many ways; first time meeting new friends... first Chinese cemetery... first time experiencing a taste of "the jungle"... first time seeing monkeys... first time seeing wild dogs and who can forget the first time being bitten by mossies!! Any way it was a serene place, set amongst undulating terrain many of the graves are well hidden but although close to homes and busy roads its an amazingly tranquil place. 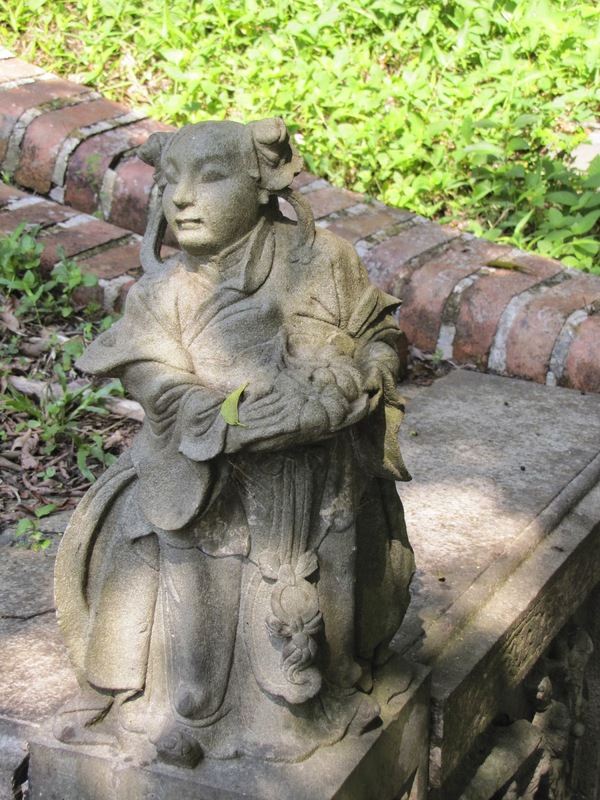 Now I know a Singaporean friend of mine cannot understand my fascination with cemeteries and just doesn't "get it" so I apologise to her for this post!!! 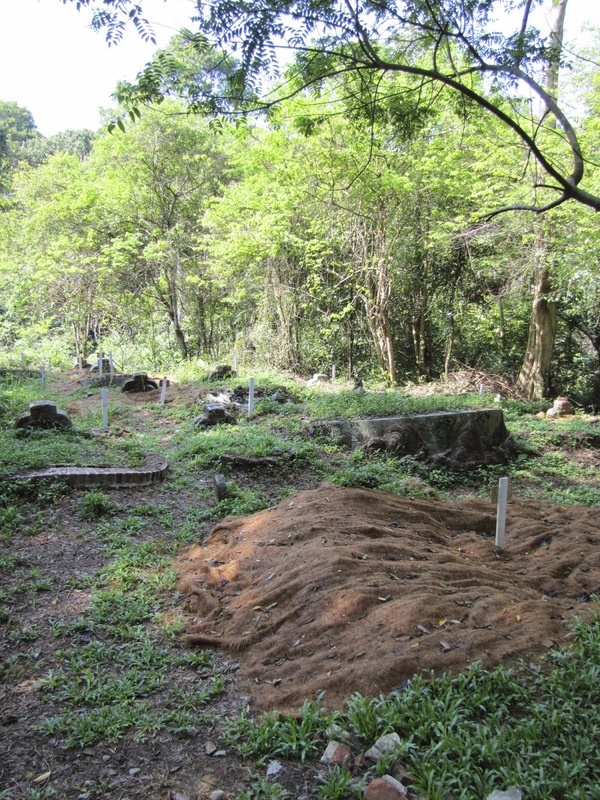 Bukit Brown was also known as Kopi Sua/Coffee Hill after a nearby coffee plantation at Mount Pleasant. 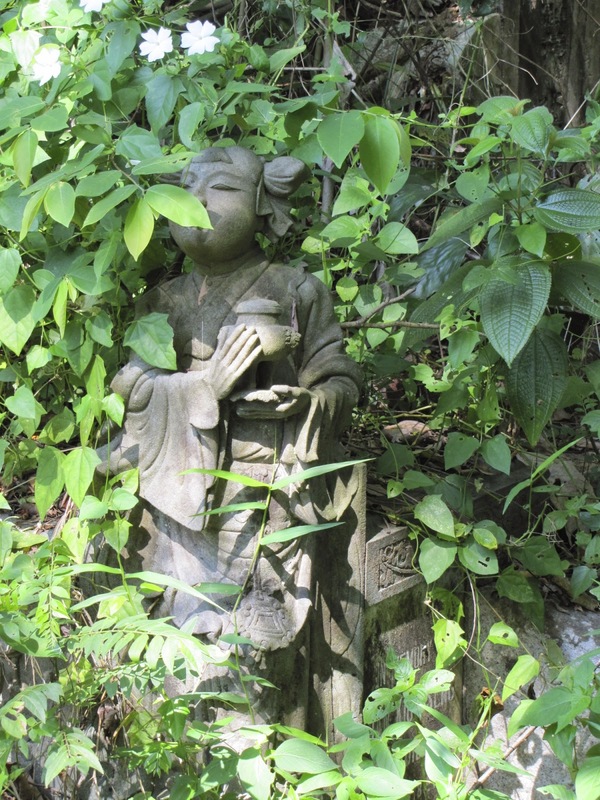 It is the biggest Chinese cemetery outside of China once covering 213 acres. Named after the businessman and shipowner George Henry Brown who came to Singapore in the 1840s who purchased the land before later passing it onto others. 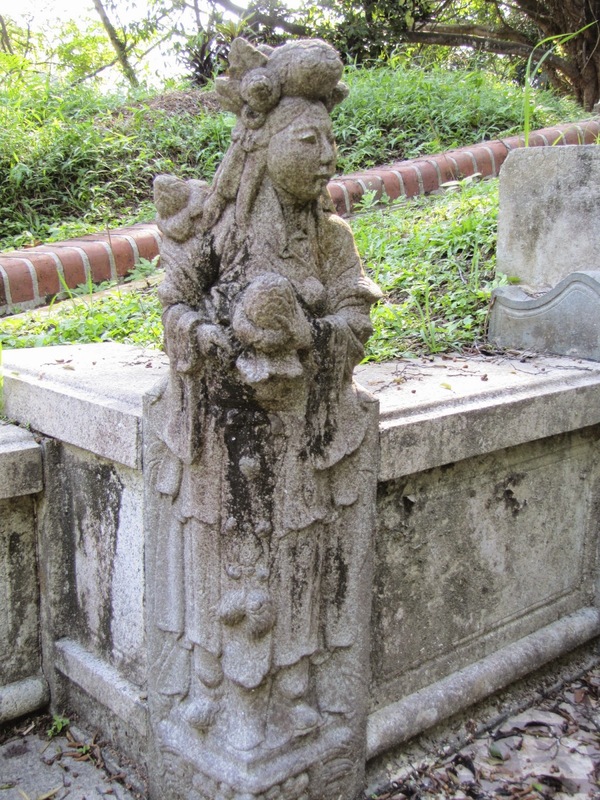 It eventually became an municipal cemetery and was opened on 1st Jan 1922 and eventually closing in 1973. 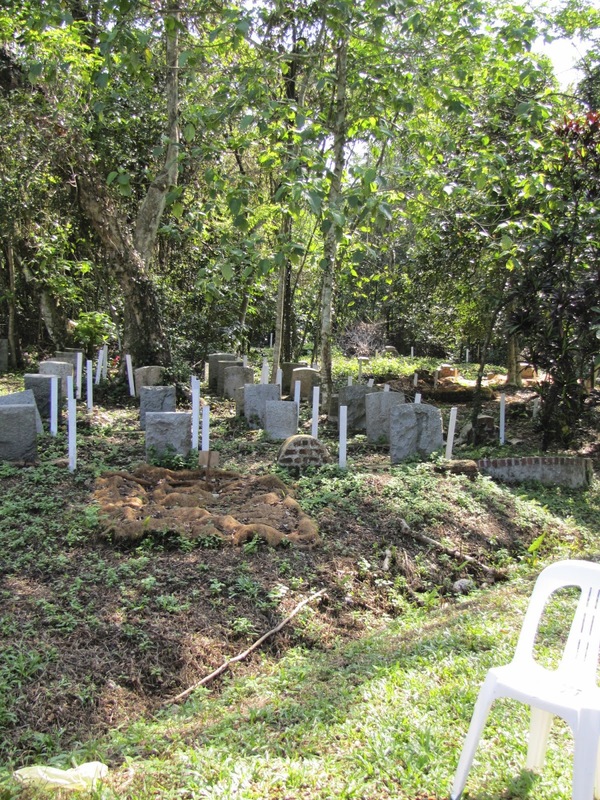 Well its been a year since my last visit to Bukit Brown cemetery and to be honest I don't think a month has gone by where it hasn't been mentioned on the TV, Internet or in print as the work has started on exhuming almost 4,000 graves. In the future it is believed that more will be removed to make way for intended houses. 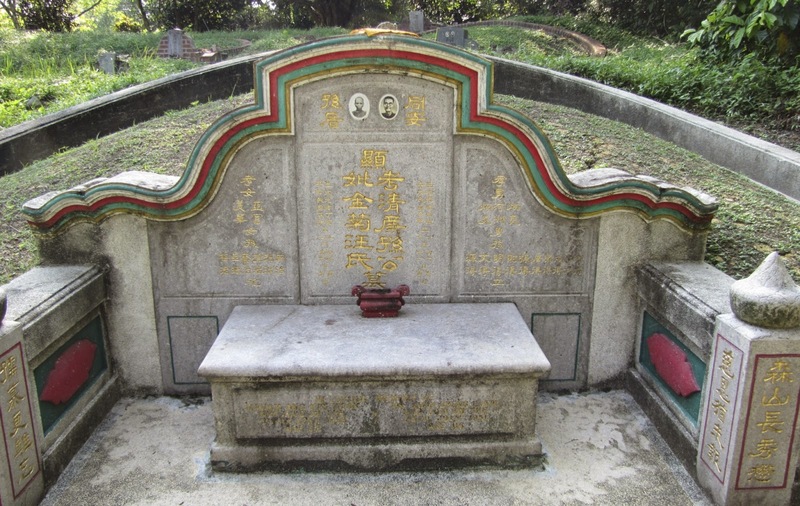 Groups have been set and much petitioning has taken place to try and save this cemetery which is the final resting place of many prominent Chinese, so important to the history of Singapore. Not only that but the fight against losing anymore green space here on this tiny island. 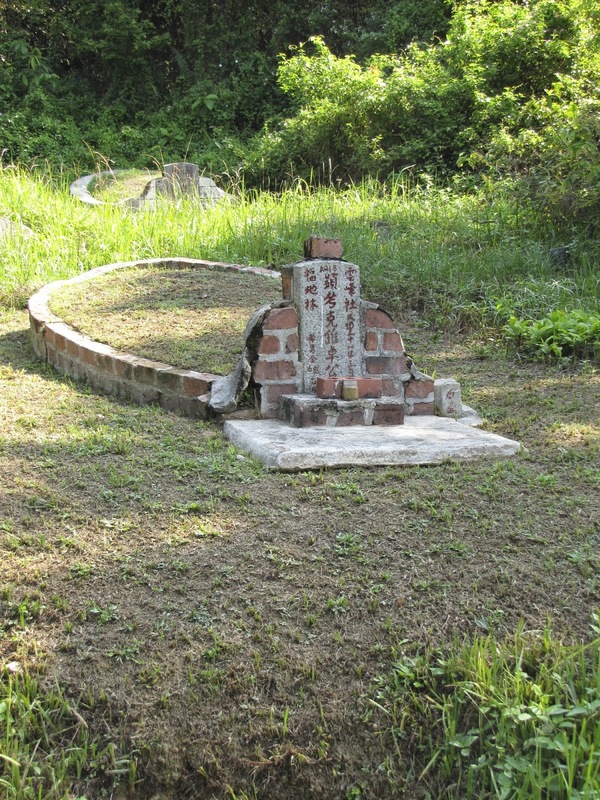 In Oct 2013 it was put on the World monument Watch. There aim is to preserve the worlds architectural heritage. Fingers crossed that although they haven't managed to stop the expansion of the highway and exhumation of the graves, no more will be disturbed. On my visit last week I was shocked to see how much had changed. 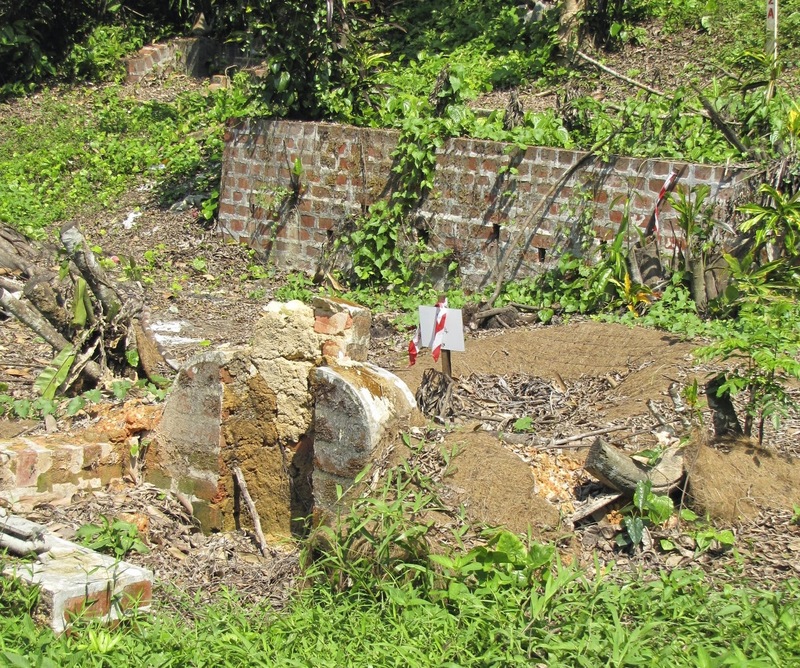 As you entered by the main gates you were greeted by green metal fencing everywhere and as I walked along the fenced off roads inside I spied through the gaps the tombs all marked up with sticks waiting for their exhumation - such a sad sight. Indeed as I later left and walked down the hill on one side of the road were the broken remains of tombs with hollows, where once were mounds, where the remains had been removed, a sorry sight amongst the cleared vegetation. This last visit coincided with the Chinese festival of Qing Ming. 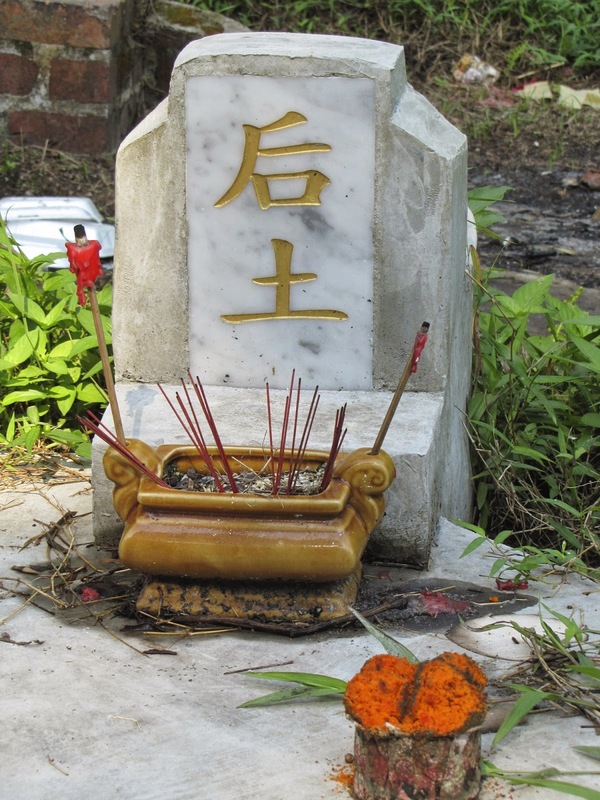 Qing Ming Festival is also known as the Tomb Cleaning festival, Ancestors day or Clear Bright Festival. It is celebrated on the 1st day of the 5th solar month in the Chinese calendar/ 15th day of the Spring Equinox, for 2014 is falls on April 5th. 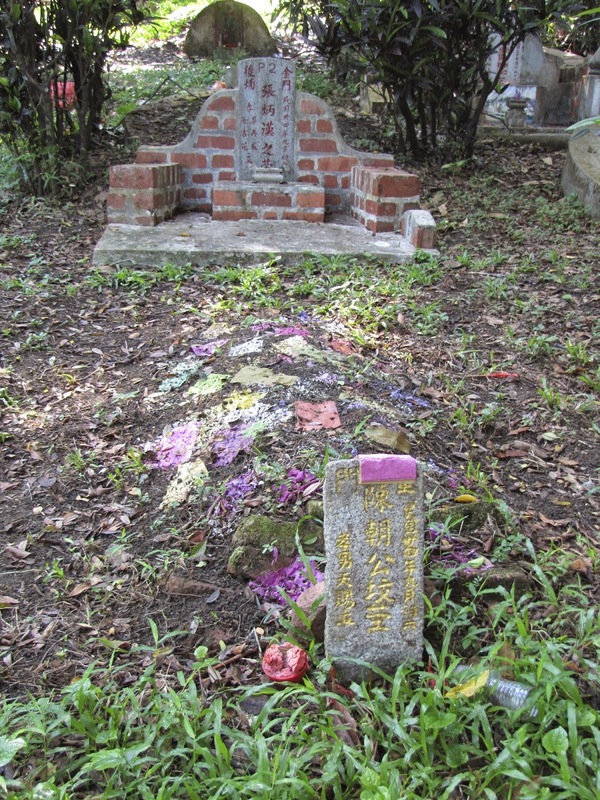 During the 10 days up to the day ancestors will visit and come and clear the ground around the tombs, cut the grass, scrub the tiles and repaint the inscriptions on the tombs. 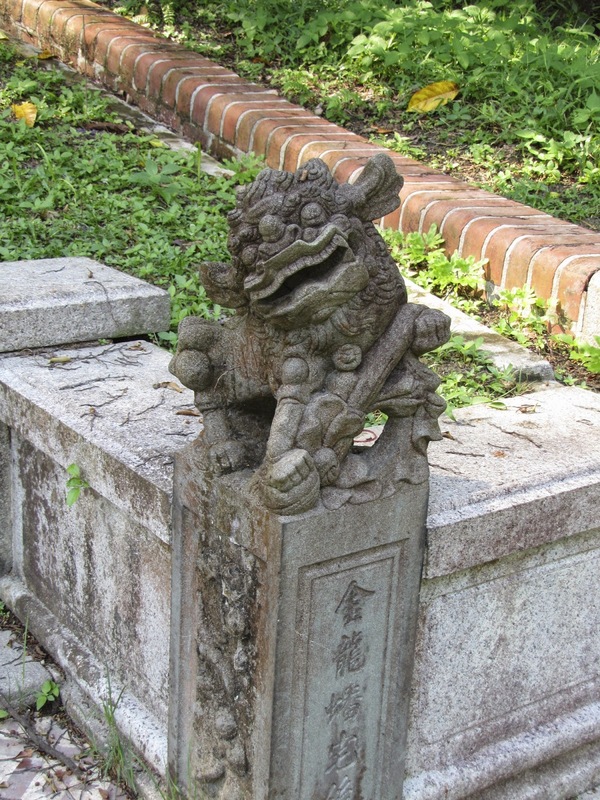 They remember their ancestors and clear the "qi" around the tombs. 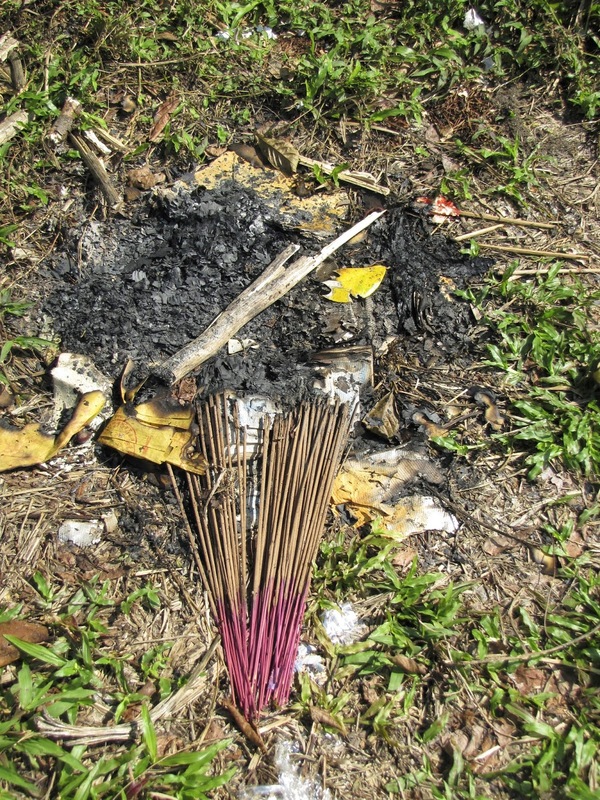 Family will visit from over seas and food and drinks consumed and left for their ancestors, chopsticks and joss paper items are burnt for their ancestors as they will need this in the afterlife. 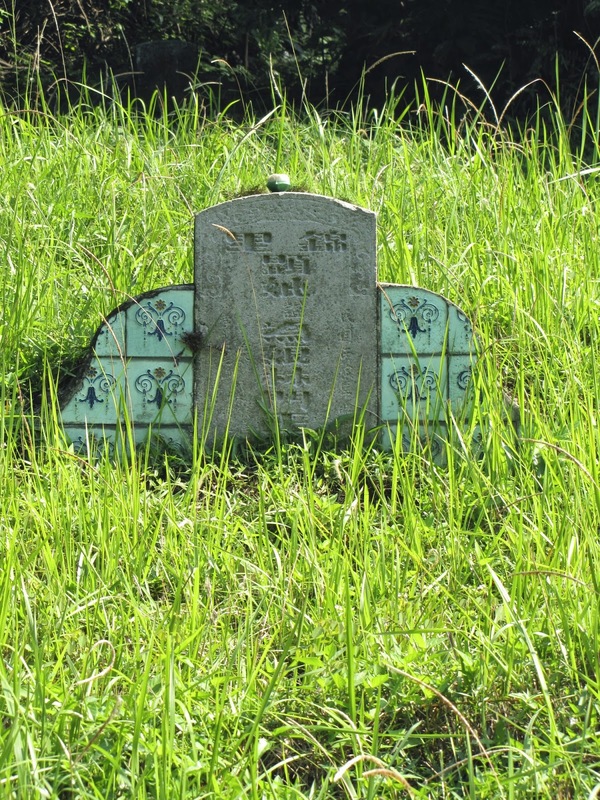 I spotted many different coloured strips of paper/material placed around and on the cleared tombs and I found that this is called "tay bong chia" in Hokkien which means putting paper on top (with a stone or something to hold them in place) The different colours represent the 5 cardinal directions - north south, east, west and the fifth being the earth, although to be honest I still don't get the relevance - can anyone explain? 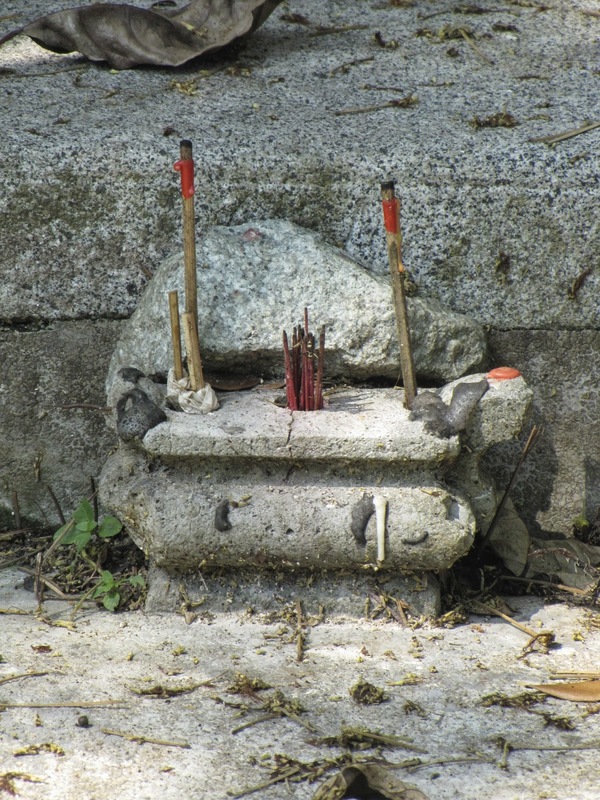 Along with the tomb clearing, eating and paper offering burnings, red candles are burnt and often willow branches are placed to ward off evil spirits. 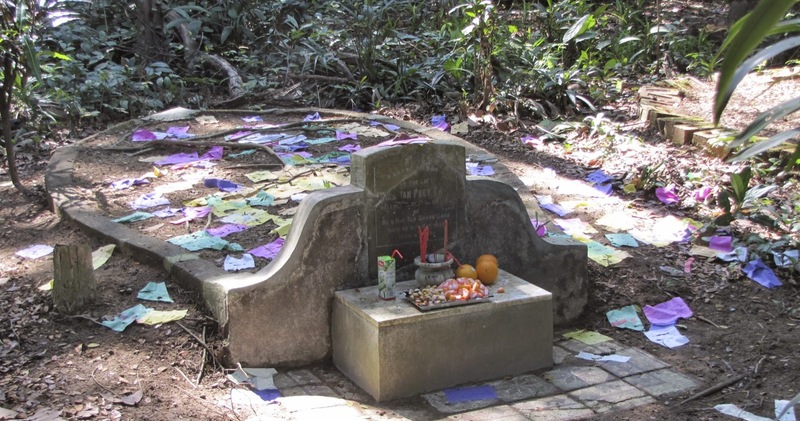 It was very interesting to walk around just a small part of Bukit Brown early on a peaceful sunny morning and view the cleared tombs and see the remains of the offerings. 1. 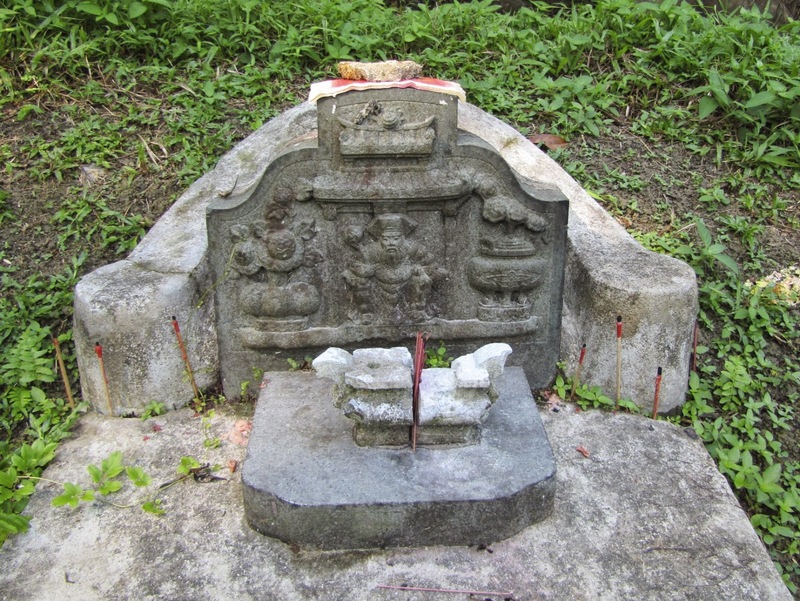 The largest tomb is believed to belong Ong Sam Leong and his wife. Dated 1918 it is as large as 10 small HDB flats! 2. 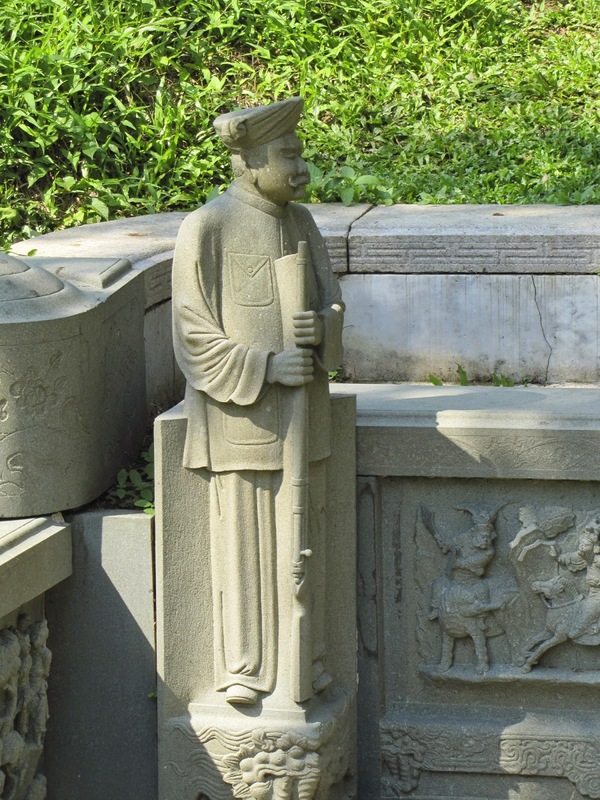 The oldest tomb is believed to be dated from 1833 and belongs to Fang Shan.